This is the outfit I wore yesterday but I really liked it and ended up snapping it today to show you guys. The lighting is terrible at the moment, now that I've accepted winter is coming and should therefore take my outfits much, much earlier! I'm pretty sick today as my cold has sort of upped its game and I'm a snotty, sniffling mess! I bought some lemon and honey to make some hot drinks to get me through the rest of the day! After I did these outfit photos I admittedly changed back into my onesie, frog socks and dressing gown! I love this ASOS swing dress, I have the long and short sleeved versions as I think it's so wearable and perfect for any occasion. I paired it with my beloved black New Look fur stole, which had it's first outing of the season. I can't express how much I love that stole! 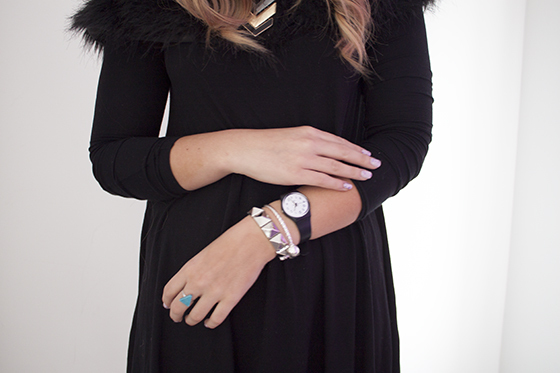 It's perfect for adding a luxe edge to any outfit! I don't know if they have them this season, but I know you can buy them from Topshop or River Island at the moment! Currently this River Island jacket, that Im literally asked about all the time is in stock on the ASOS website so I recommend snapping it up if you've had your eye on it! I know River Island have been sold out of this grey version for a while now! A black and a red version are still on River Island though! ooohmg. can't get over that coat! Gorgeous outfit, I love the statement necklace. I must get this dress. I've got all of ASOS's swing dresses and they're just so easy to throw on and look good with almost everything! The river island jacket is gorgeous and i also love your nails! The whole combination of colours go well. Hope you get better soon! I love this jacket, it's so stylish. Also it's good you've showed us a good way of layering as we're now in those seasons where we need to! Love this outfit, particularly the jacket it's beautiful! I seriously need a fur stole and onesie in my life. Love the game of thrones quote / stole / warrior Esque jewellery. Entirely possible I have made up all of those references in my mind but hey-ho! Looking stunning Lily :) lovely dress! Hope you feel mucho better soon. You are so pretty, i love your blog! I adore this outfit! Especially the necklace, which is stunning! I really love this dress, definitely my kind of thing but I find ASOS stuff tends to shrink loads in the wash? Wow you are so beautiful and I absolutely love the boots! Are they the ones on your ASOS Haul video? 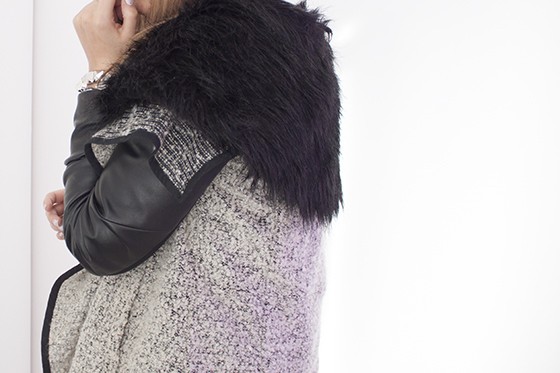 I absolutely LOVE your combination of the fur and the jacket and the structured pieces alike. Love it, I've got a similar leather sleeve jacket from River Island but mine's already got fur on it. The only thing is it's boyfriend fit so I went down a size as I prefer coats more fitted. Your whole outfit is stunning, great contrast between the drape and the leather jacket! Brilliant, loving these leather jackets, think ill try your look with there! Love the simplicity of the dress with the amazing coat! Love your nail design and your outfit is gorgeous! Sadly I've found shouting "winter is coming" whenever I set foot outside doesn't make it any less cold :( that coat looks super warm though. Whoa! I really love the fur stole Lily! I love your hair, how did you style it like that? 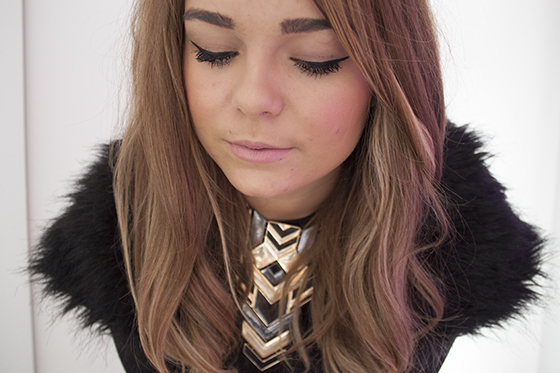 How do you always find Amazing Primark necklaces! !